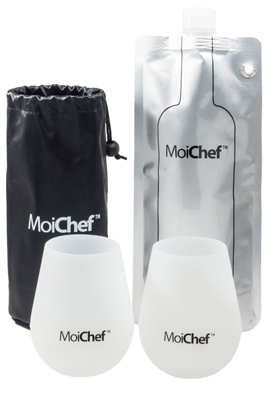 I just got this great portable wine set from MoiChef. You get a great reusable collapsible wine bottle, it holds an entire 750ML bottle of wine. You simple add your win to the bag and then you can unscrew the top and easily pour the wine. It’s great because you can easily take wine on the go with you. It even has a hole on the corner you can attach a string or clip to carry with. This set also comes with two collapsible silicone wine glasses. These are great little glasses that you can take with you on the go. Just pop these up and you can add your wine to it, it holds it’s shape while drinking well. It’s silicone so I find it helps to keep the wine’s temperature cool too. When you are done rinse out and fold up to go to the next location. Everything comes in a great carrying case. This is great for picnics or going to an outdoor event or lake. You can have everything you need in one convenient tote bag. WINE GLASSES WITHOUT THE BRITTLENESS; enjoy the look and feel of wine glasses without the risk of ever breaking one. Silicone wine glasses are shutter-proof and will never crack, stain or deform. STYLISHLY AWESOME; silicone wine glasses have simply impressive design. The shape is great for easy handling while the awesome 12-ounce capacity makes them great for serving wines, beer or soda at any outdoor event. UNIQUELY VERSATILE; the silicone wine glass are good for almost anything. Besides serving drinks and cocktails, pop them in the freezer to make icy drinks and deserts; or in the microwave to make some sweet dessert treats. FLEXIBLE AND DURABLE; fold, bend or collapse the silicone wine glasses during use or storage but they’ll remain unbreakable. You can even shove one into your pocket but they’re much better off stored together in the stylish pouch. You can purchase on Amazon!